Crystal Palace, QPR, Millwall, and Watford began their Division Two campaigns at the weekend. Combined total of points gained: 1. Not the best of starts then, but a quick opportunity for redemption tonight. In theory at least. The Palace have a tricky tie tonight away at Wolves. Glenn Hoddle's men started the season as they ended much of last season, with a draw. You know, of course, what happened to the Eagles on Saturday - they turned out for an easy win against newly-promoted Luton, forgetting to actually do anything to make the win happen. 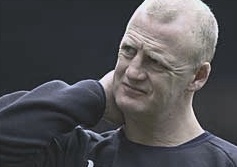 Iain Dowie is hoping to have Dougie Freedman back for this one (as well as the 11 who "played" at the weekend). Londonist Predicts: 1-1. QPR were the only London Division Two side to get a point at the weekend, bringing a 0-0 draw and plenty of bad feelings back from Hull. The Super Hoops are at home to much-fancied Ipswich tonight (kick-off 7:45 at Loftus Road). The Tractor Boys got off to a decent start at the weekend, beating Cardiff 1-0. The R's already have injury problems with Lee Cook and Dean Sturridge out, and late fitness tests for Marc Bircham and Danny Shittu. Londonist Predicts: 2-1 to Ipswich. Millwall were expected to lose away to Leeds, which is exactly what they did. Not that boss Colin Lee minded much: "If you look at that performance today, I would say we won't be struggling against relegation." so that's alright then. The Lions are at home against Coventry this evening (kick-off 7:45 at The New Den). The Sky Blues managed to get a draw from their opening fixture against promotion favourites Norwich on Saturday and will be looking something similar, if not better from this one. Want-away midfielder David Livermore could return to the line up after being "injured" for the Leeds game. Londonist Predicts: 1-0 to Coventry. Watford's young team started brightly against Preston on Saturday, but were then overrun and their 2-1 defeat could have been worse. The Hornets travel down to Plymouth who took an impressive 2-1 win from their visit to Reading at the weekend. Watford boss Adrian Boothroyd is expected to rush Gavin Mahon back from injury in an attempt at beefing up his young midfield. Londonist Predicts: 3-1 to Plymouth. Elsewhere, Brentford are away to Chesterfield tomorrow evening, while tonight Barnet are away to Northampton, and Leyton Orient are away to Bury.